The shimmering pearl effect created by these colors is startling! Apply these beautiful inks with a dip pen, ruling pen, or brush. All colors are intermixable, translucent and permanent, and work best when put down freely rather than applying successive layers of color. The pigments used to make these inks are large in particle size, so they will not go through fine-line airbrush nozzles, nor are they suitable for technical pens or fountain pens. The breakthrough in color technology provides almost limitless creative potential in areas not normally associated with inks, including applications to wood, leather, paper, and board (and to a limited degree, glass and ceramics). Each glass bottle contains 1 oz (30 ml). 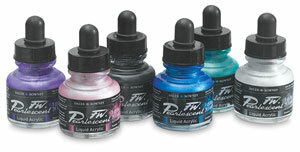 Pearlescent Effects Set of 6 — Set of six 1 oz bottles contains one each Black, Moon Violet, Waterfall Green, Galactic Blue, White Pearl, and Platinum Pink. Daler Rowney makes beautiful intensely colored and shimmery pearlescent inks using a wide assortment of pigments and resins.